Southern Lehigh Ranch - Welcome home to this sprawling Southern Lehigh ranch! Situated on a desirable corner lot, with nearly an acre of ground including in-ground pool! As you enter this sturdy brick home, you are greeted by the cozy foyer area - open to the spacious living room with warm, inviting fireplace as the focal point. Perfect for entertaining, the bright, airy living room allows access to the updated kitchen and sunroom. Modern kitchen features tasteful countertops and cabinetry accented with tile backsplash, plus newer stove and dishwasher. Allow the gleaming hardwood floors to guide you through the remainder of the home and you will find 3 generously sized bedrooms, each with spacious closets and one features the half bath. Plenty of parking in the wide driveway, plus oversized 2 car garage perfectly situated to create a private outdoor oasis focused around the stately rectangular inground pool. Beyond the pool, there is still plenty of green grass and utility shed as well as playset. Updated Cape - Modern, open concept floor plan in quaint Richlandtown! Fully renovated kitchen provides an open flow to the living room, as well as granite countertops, newer SS appliances, tile backsplash. Living room provides a wealth of natural light through the newer windows, as well as a separate sitting area with pellet stove. 1st floor is complete with bedroom and updated bathroom with tasteful tile. 2nd floor features two spacious bedrooms, one with an exceptionally large walk-in closet. Basement is partially finished for additional living space and provides another full bathroom (renovated 2015). Some newer windows. Updated electric panel and driveway (2016). Fenced yard (2018). New roof on house and garage (2014). Detached, 2 car garage with updated electric service. Convenient to all major routes but located on a quiet, Borough street. 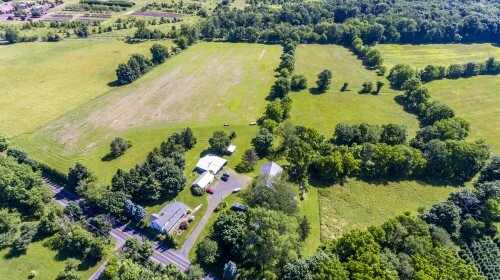 Bucks County Farm - Offered for sale for the first time in over 50 years, this Bucks County home provides historic character on over 40+ acres sprawling farm land! Let the cozy, covered front porch with nicely pointed stone welcome you into a world of rustic charm. The first floor features a spacious living room with decorative beam and hardwood floors, formal dining room with stone fireplace and wood burning stove and deep window sills plus kitchen with stone accent. 2nd floor features 3 bedrooms plus a 4th room ideal for dressing room, nursery or office as well as the full bath. Large, enclosed, knotty pine porch just off the kitchen to enjoy the tranquil outdoors. The large barn provides both first and lower level area for a multitude of uses and the detached garage provides for additional storage or workshop space. Act 319 allows for low taxes. The showstopper literally lays in the ground. With over 40 acres of gently rolling countryside, the possibilities are truly as endless as the view!